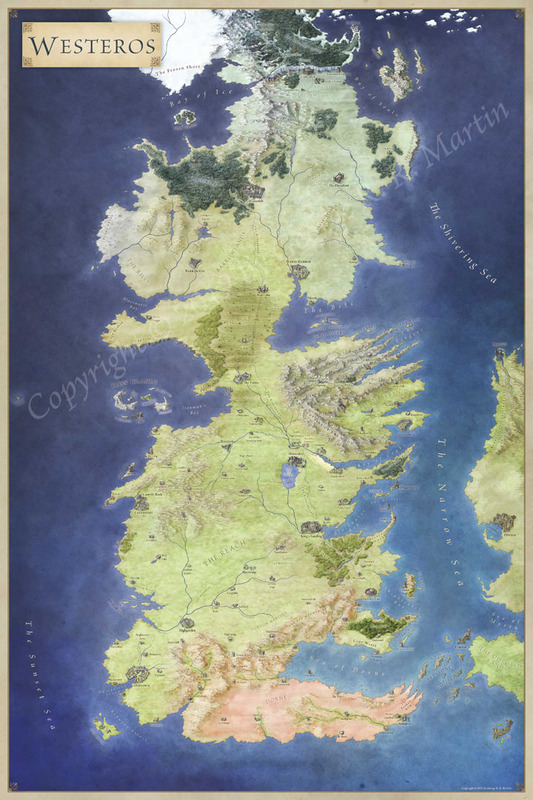 City maps are complex beasts. There’s a balance to be found between detail and time. The ideal is to be able to imply all the detail of a city, without getting lost drawing every single roof tile. Parsantium is no different. 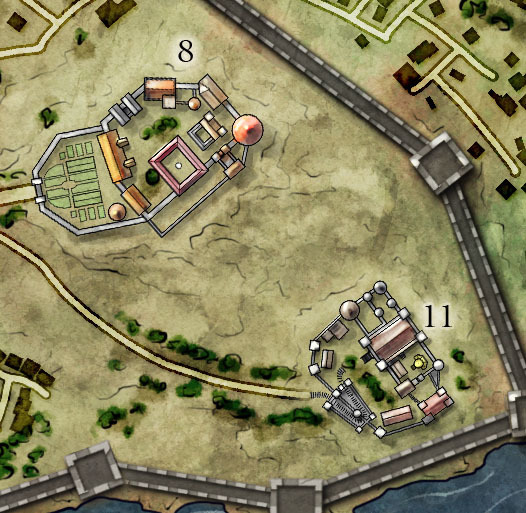 Here we have a large number of wards, separated by city walls. Each ward has it’s own flavour, separated by economics, race and status. The city is split by a vast river and the single thread of a pair of bridges. At the hub, the heart of the city, stands a titan. 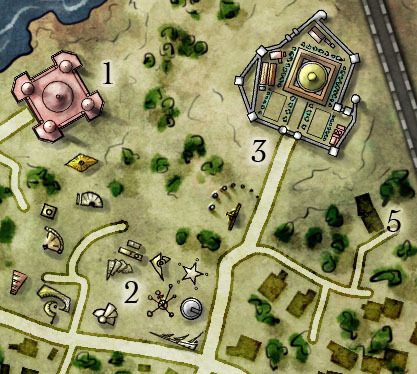 Here we have a golden domed grand temple, with a large courtyard, as well as a vast arena. In a garden studded ward to the east we ind a palace surrounded by trees and an observatory of diverse mechanical constructs. Different wards have different colors to easily differentiate them. The simple house shapes have an added tone to pull them apart. The simple shapes allow for the numbers that represent the large numbers of locations in the city (seriously – check out the size of the legend above!). As the city is on a huge river, no surprise that ships play a significant roll. 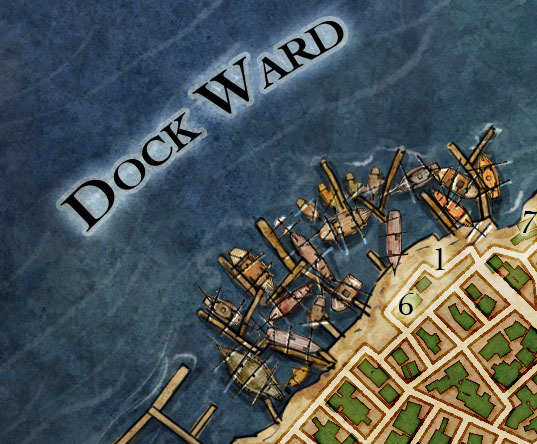 Here the docks ward has a slew of aging junks that provide a floating shanty town. To the north of the river, a palace and a castle stand in a separate ward keeping watch. There are hundreds of locations throughout the city, each with backstories and plots. Go, grab the pdf, and lose yourself in Parsantium, City at the Crossroads. 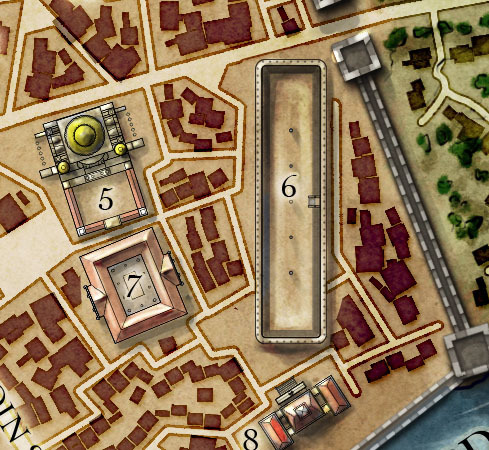 To see how the large numbers of houses were illustrated, check out this tutorial. This is superb! I especially like the Dock Ward. 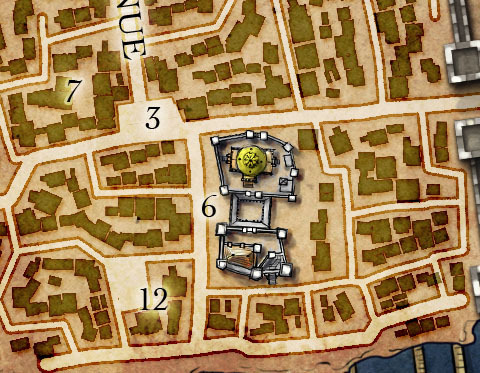 The way you depict the buildings on a lighter lot, setting them apart from the streets, is genius. Thanks! That was a fun challenge on this one.